I just read a really good book, y'all — All Signs Point to Murder by Connie di Marco, the second book in the Zodiac Mystery series. Let me tell you why. The complex story line captured my attention right away. There's so much going on in All Signs Point to Murder, which made it un-put-down-able. As Julia investigates, on behalf of Geneva, to learn exactly what happened the night of the shooting, she discovers more and more possible reasons and perpetrators. I suspected the correct person sooner than Julia did, but this did not spoil my enjoyment at all, because the motive was still a surprise. Julia is engaging and easy to like. She has a great support system, between her grandmother Gloria and her BFFs Gale and Cheryl. There's a wonderful dynamic between Julia and Gloria. And, of course, Maxie totally approves of how well-written Julia's cat Wizard is. I like the detailed descriptions of the San Francisco environs. The climax is quite thrilling. 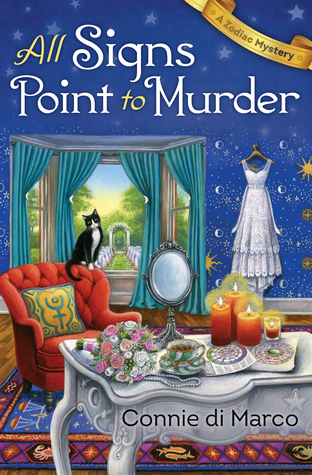 I recommend All Signs Point to Murder to all cozy mystery fans. I think readers who are astrology buffs, residents of San Francisco or wannabe residents, and fans of the Soup Lover’s Mysteries by Connie Archer will especially like it. I really enjoyed All Signs Point to Murder by Connie di Marco, and hereby bestow upon it Four Kitties! Note: I voluntarily reviewed an Advance Reader Copy of All Signs Point to Murder. 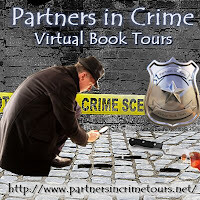 For an excerpt from All Signs Point to Murder, visit my blog post for August 3. If I only included amateur sleuths, my list wouldn’t be quite that long, but then I’d have to leave out some of my favorite authors and favorite films. Films like The House Across the Bay (http://reelsf.com/the-house-across-the-bay-1940/) where George Raft watches and bides his time through the bars of his prison on Alcatraz. Or The Golden Gate Murders (https://www.youtube.com/watch?v=RhP5MJgHQYM&t=3002s) with David Janssen as a cop and Susannah York as a nun who team up to catch a silent murderer. Those scenes have stayed in my mind for years and I don’t think I’ve ever driven across the Golden Gate Bridge and not remembered the orange-caped (to match the color of the Bridge) murderer. Perhaps he’s still lurking in the towers of the Bridge. Lots of foggy atmosphere too! But my all time favorite fictional San Francisco detective is Sam Spade in The Maltese Falcon (https://www.youtube.com/watch?v=5K5KOw5f0qw). 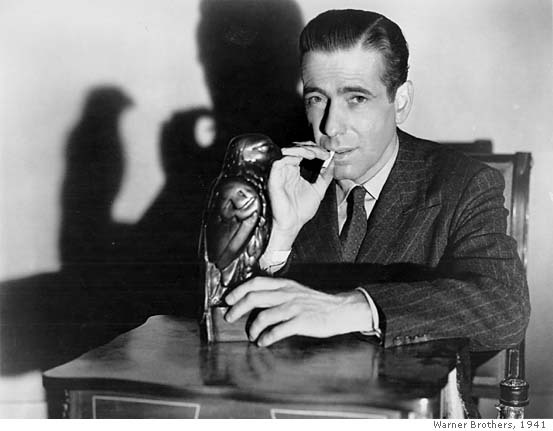 I loved it in book form and in film (the 1941 version) with Humphrey Bogart of course. I can just imagine Dashiell Hammett, the author, at his apartment at 891 Post Street writing his novel and even using his own place as the setting for Sam Spade’s digs. But the story of the Dingus wasn’t the first crime novel set in the Bay Area. Not by a long shot. There had been scores of other books. The earliest I’ve read of is The Mysteries and Miseries of San Francisco (1853) by an anonymous author. It has the distinction of being the earliest known crime novel with a Bay Area setting. As for film and television, how could I not mention The Streets of San Francisco? Starring Karl Malden as Detective Mike Stone with Michael Douglas (1972-1977). Or the Dirty Harry films (1971-1988) — Inspector Harold Francis "Dirty Harry" Callahan, an icon of an antihero who crosses all sorts of ethical boundaries to pursue justice. Or even Nash Bridges with Don Johnson and Cheech Marin as inspectors with the SFPD. Or how about Monk? Adrian Monk, a truly unique detective with OCD and multiple phobias? The list goes on and on — there’s Juliet Blackwell’s witchcraft mysteries with Lily Ivory, and Robin Burcell’s inspector Kate Gillespie and Kate Carlisle’s Brooklyn Wainwright, a rare book expert. 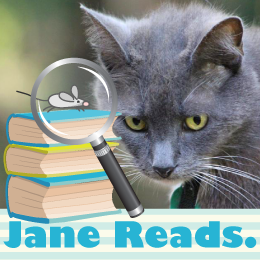 There’s Dianne Day’s Fremont Jones series set at the turn of the century and Meg Gardiner’s Jo Beckett and then Marcia Muller, Bill Pronzini, Joe Gores, James Patterson, Laurie R. King’s Kate Martinelli and John Lescroart’s Dismas Hardy. The more I searched, the more I found. This couldn’t possibly be covered in a blog post, there’s enough material for ten volumes at least. Here’s Don Herron’s website. (http://www.donherron.com/some-essays/collecting-san-francisco-mysteries/) He’s a collector of San Francisco mysteries. And guess what? My San Francisco sleuth is there! Check out the picture. I breathed a contented sigh of relief. Julia Bonatti isn’t alone. 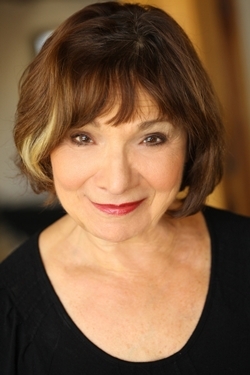 She’s in some great company and proud to join the ranks of fictional San Francisco sleuths. And so am I, thrilled to be able to contribute to a wonderful genre. I hope every reader will enjoy Julia’s world as much as I enjoyed writing about it.